Though unconfirmed, the media waves have over the last few days been abuzz with sweet and amazing grapevine for the nation. This is because our Kenyan-hood is once again re-energized by the news that the leader of the Reform movement in Kenya held a meeting with the youthful, action oriented Eldoret North MP the defacto leader of the URP. Most analysts have been quick to insinuate that this is about two people intent on striking a power deal and so on. I see more than that. I hear echoes of two leaders who have always cared about their country, re-evaluating the direction that the country is headed. This is not the first time that these two patriotic leaders have had their paths cross each other when sensitive matters of national interest are at stake. To a Raila ticket, Ruto would bring youthfulness, energy and drive. As a man who Miguna in his Magnum opus peeling back the mask describes as one with â€œintelligence, charisma and generosityâ€, his unmatched grassroots mobilization skills would definitely re-energize the duoâ€™s national political enterprise. Ruto who is currently a PhD student at the University of Nairobi, would also add intellectual prowess into the Raila 2013 campaign. This augments Railaâ€™s numerous PhDs awarded by different universities in different countries around the world in recognition of his place as one of the greatest global thinkers of our time. As a self made man who came from grass to grace, Ruto who has also lived it, brings to the ticket a clear understanding about the plight of the hustlers. Rutoâ€™s story is a classic case of how a Kenyan boy of limited means can rise from obscurity to prosperity and political success. His is an incredible story of a man who conquered poverty without a recognizable surname and in the process earned himself an enviable place in Kenyaâ€™s political high table. As a wealthy businessman in his own right, Ruto stands to bring into the dream ticket immense resources which would go into oiling the Raila-Ruto political campaign machinery. My reminiscence in retrospection tells me that whenever Ruto works with Raila, the duo have always excelled. For example in the 2007 elections, they upstaged the former president Daniel Toroitich Arap Moi, and in the process drove the last nail into Kanuâ€™s political fortunes in the vast Rift Valley Province. 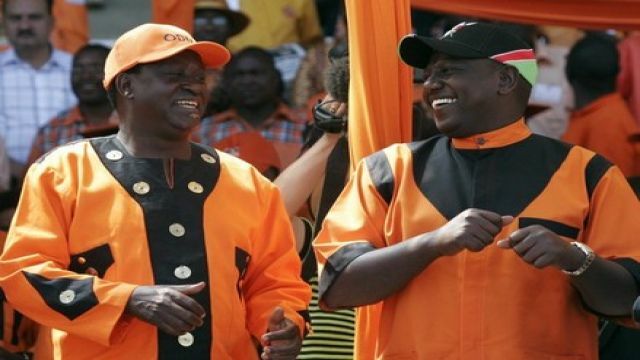 It has always been a strongly held belief among the ODM faithful that Ruto deserved the ODM slot for Deputy Prime Minister and Deputy Party Leader positions, because unlike Mudavadi, he delivered more votes than the Mis-learner and Mis-reader of the peopleâ€™s mood. Any deal between Ruto and the Raila would be overwhelmingly endorsed and guaranteed by the orange faithful who would in turn reward him handsomely in future, especially in the Post-Raila presidency because this would be the third time after the 2005 referendum and the 2007 election that he would be party to the furtherance of the peopleâ€™s cause. This is important for Ruto as Railaâ€™s political stronghold spans over 6/8 provinces and stands to be inherited by a Raila anointed heir at the end his promised one term presidency. This is a very attractive offer for Ruto considering all the leading candidates will again be in the race come 2018. A Raila endorsement will definitely be the killer knock-out punch in 2018. As Raila and Ruto pair goes, so will the nation. The Raila-Ruto ticket is likely to deliver a first round win of over 60% of the vote ushering in President Odinga and Deputy President Ruto, the two will assume reins of power with an overwhelming mandate dominating all levels of governance from county assemblies, governorships, parliament and the senate. This explains why Ruto is the only presidential candidate beyond RAO who attracts fervor, enthusiasm and excitement whenever he visits the Lakeside city of Kisumu, which is an ODM stronghold. This is because the party faithful across the country knows that when the 2 leaders work together, Kenya would attain unprecedented growth and development that would continue to consolidate Kenyaâ€™s place as the regional powerhouse. Theirs would be a ticket that guarantees national stability and unity. Rutoâ€™s entry into the Raila-ODM political axis would obviously seal and confine Mudavadiâ€™s political fate into the dustbins of political History. This is because the battle-lines are drawn, and as prophesied by the Peopleâ€™s President, come 2013 it will be a two horse race. Uhuru Kenyatta, the TNA horse, seems to have settled on Eugene Wamalwa as the running mate. That leaves Mudavadi in the political cold- a confused, rejected and dejected man who, like nuclear waste, has been duped and dumped into the desert of political wilderness. And as evidenced by the Bukura ward by-election, a Raila-Ruto ticket would undoubtedly paint Western province orange. Mudavadi claims to be like Messi but the Bukura ward by-election demonstrated that he doesnâ€™t play in Messiâ€™s league. Certainly not in Kenya, Maybe Malawiâ€™s Division V! Now the Bukura success happened even before Ruto came on board. Analysts expect that once Ruto, who is an indefatigable campaigner, joins the ticket; the synergistic effect is going to reduce Musalia into a case-study of how never to make political decisions in a political environment where Raila is the top â€œdawgâ€. A Raila- Ruto 2013 ticket would be invincible and is expected to be a Tsunami that sweeps all the dirt into the shores of the sea and any formation working counter to it would be scattered into the four winds. The voting patterns in 2013 would be a replica of 2007, only that this time, the margins would be larger because unlike PNU which had a slightly better national appeal; Uhuru Kenyattaâ€™s TNA support is having problems extending beyond the 1997 DP strongholds. A deal with Raila is more attractive to Rutoâ€™s support base owing to the emotive historical injustices that Uhuru may not be comfortable to tackle especially the land question. It is therefore my prediction that a Raila led political formation is headed for a crushing cruise to unprecedented election victory. The night of March 4th 2013 would be historical because it would be one that Kenya and the world have for many years been waiting for- a culmination of a journey. The only low note and which gets to the core of my emotion is that thanks to the machinations of the wing of the grand coalition that controls the security instruments, Ruto is now involved in a huge legal battle- a heavy price that he shoulders for taking on the mercenaries of a stolen presidency. Whereas it is widely acknowledged that NSIS provided evidence (ignorantly believing the matter was to die at the end of the Waki commission) that implicated Uhuru and PNU team, Rutoâ€™s implication in the mess is alleged to be an effort by the then constitutional minister Martha Karua, other powerful PNU forces and the civil society. It is agreed by many that the ICC Prosecution teamâ€˜s evidence cannot sustain a Ruto conviction in a fair trial. I have no doubt that the ICC will dispose of this matter and Rutoâ€™s innocence will at last be confirmed. Of importance is the determination by Raila to unite the country and focus all our efforts in nation building. Rutoâ€™s energy to perform will be a great asset to the government and people of Kenya as we embark on getting the economy on a growth path from the current stagflation. I endorse RailaRuto political arrangement. Its good 4 the sake of our country. This is a deliverable mix to kenyans..watch this space! There is no permanent enemy in politics so ruto/raila merger is the best in kenya his tory. The best mix we could ever get! … In the name of keeping the dream alive! This is a fomidable team.keep it going. In case they run together there will no be run off in forthcoming elections. This' going to be excellent!